Create a fun family memory with a dinner party just for your family staring your favorite Arcade video games from the 1980s. 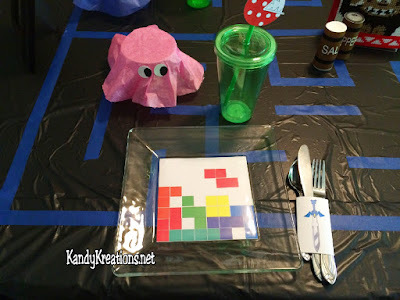 Pac Man, Donkey Kong, Super Mario, Legend of Zelda, Tetris, and Frogger all make an appearance at this dinner table setting with fun printables and easy DIYs. Do you want to win "Mom of the Year" from your kids? I know, it sounds like an impossible dream. And it really probably is. But how about "Mom of the Day"? Seem a little more reasonable. But also like a lot of work right? It's not really. Kids like the little things, popsicles from the Ice Cream truck, running through the sprinklers without worrying about the grass, a few minutes of alone mom time, and fun family themed dinners. 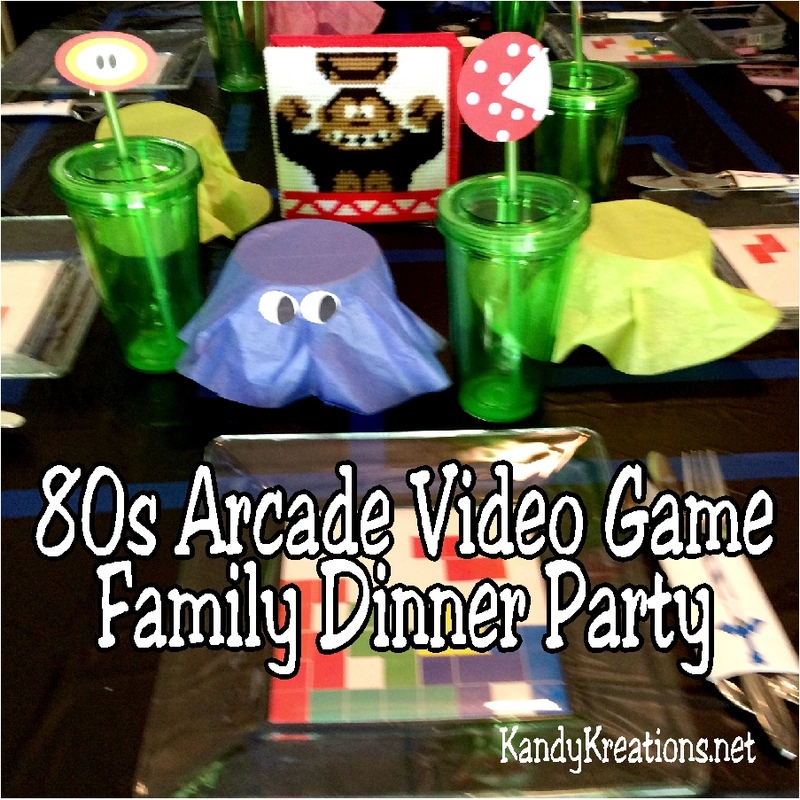 This week we had an 80s Arcade video game dinner theme. 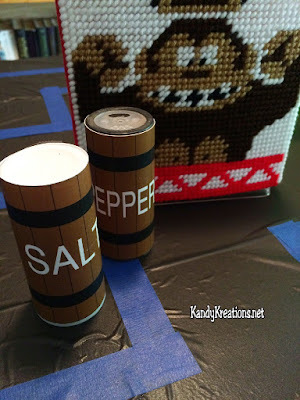 It was fun to base the party off my favorite video games with Donkey Kong, Tetris, PacMan, Super Mario Brothers, Legend of Zelda, and Space Invaders all making a showing. I printed the dinner menu onto the Arcade 5x7 poster prints (available in shop). We had Donkey Kong breasts (Brown Sugar Garlic Chicken breasts), Tetris pieces (cubed potatoes), Pac Man fruit (a fruit salad with strawberries, cherries, bananas, and watermelon pieces), Mario Mushrooms (home made rolls), and Space Invader Shots (beverage recipe here.) We even created some more Frog Log cookies since I am totally addicted to them and needed an excuse to make some more. The Brown Sugar Garlic Chicken breasts was a new recipe for our family. 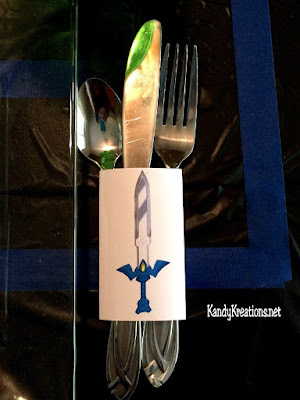 I wasn't sure how it would go over, but found that making it now and renaming it something fun, was a great way to get the kids to try it without the "yew" that comes with new dinner recipes. It was different than things we normally eat, but we decided we loved it in the end and will definitely be making it again. 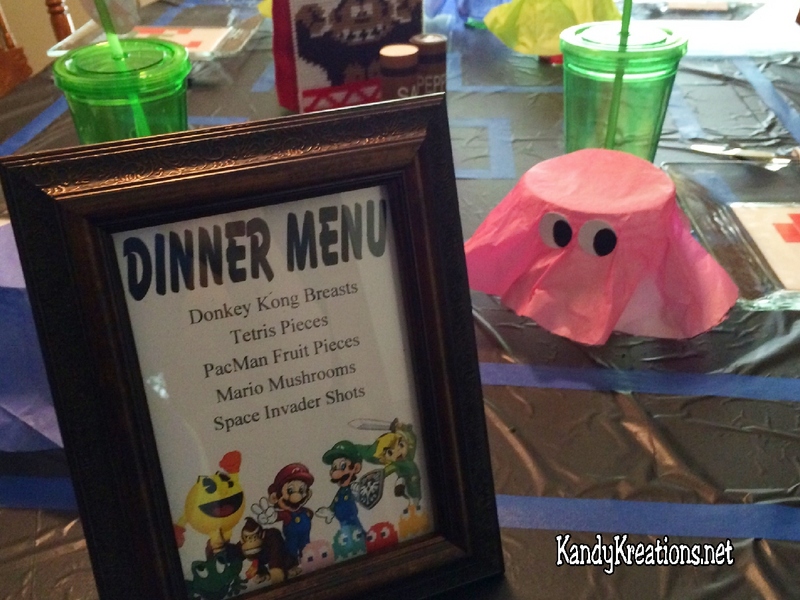 The table cloth was a black plastic cloth that I purchased from Dollar Tree. 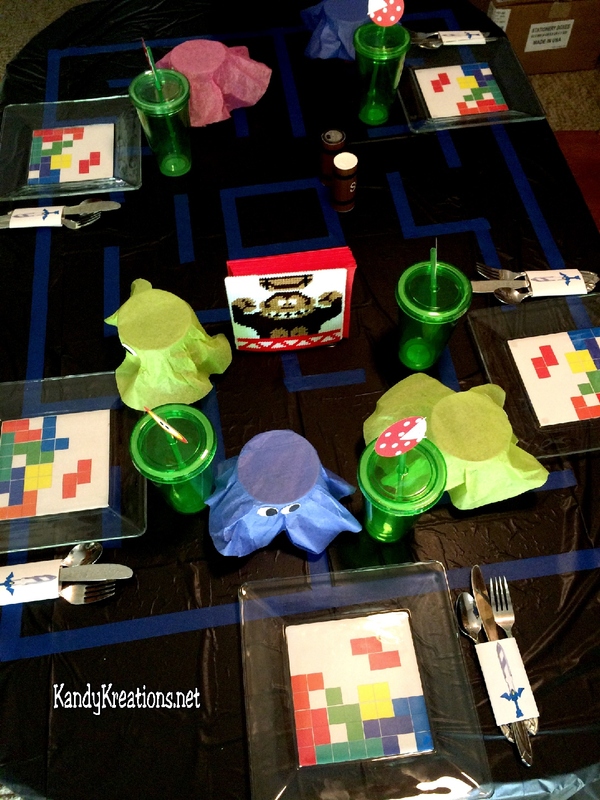 I used some blue painters tape to add lines to make the table cloth look like a Pac Man game board. The table setting included the Tetris plate printable on the back of Dollar Tree square glass plates, green cups with lids and straws (also from Dollar Tree) with the Super Mario flower straw printables, the Pac Man serving cups, and silverware in our Legend of Zelda sword silverware sleeve. The cups were perfect to look like the plants in Super Mario brothers, so I simply added printables to make the top of the straw look like the different flowers in the game. 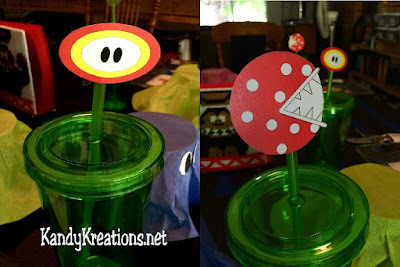 I cut out the printable and added a piece of tape to secure it to the top of the straw. 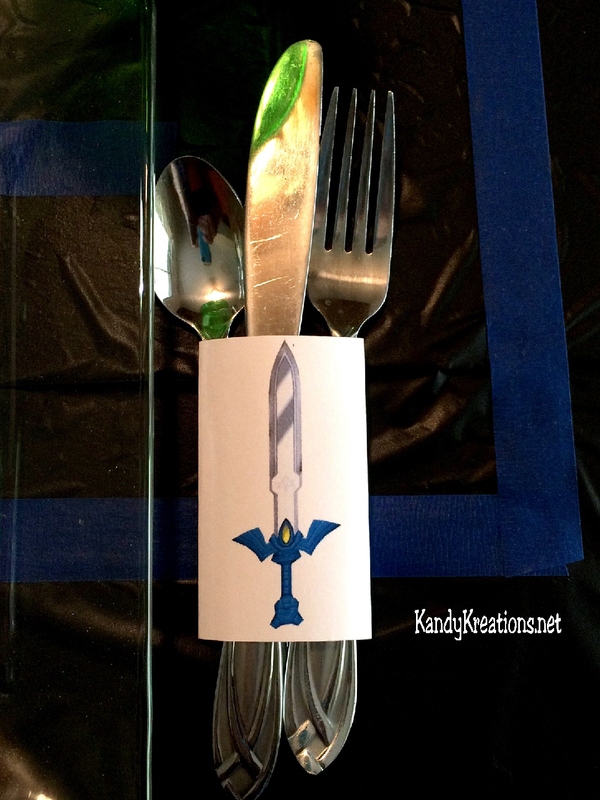 I printed out and folded some Sword sleeves based on the Legend of Zelda game and slid the silverware down inside that before placing it to the side of the table setting. Donkey Kong made an appearance on the plastic canvas napkin holder I created (find the pattern here) and I used a set of Salt and Pepper shakes from Dollar Tree to create some Donkey Kong barrels. We had a great time at dinner. It seemed like the kids were a lot more excited and happy at dinner during our party. I loved how we all talked and had a good time. And I was given a mention of "the Best Mom in the Whole Wide World." I take that as a win. Sounds like such a fun idea! My kids (adults) still like playing some of those games. :) Blessings to you! I'm your neighbor at #TuneInThursday.